At Quilt Market I finally got to play on the sewing machine I've been drooling over in Quilting Arts magazine. 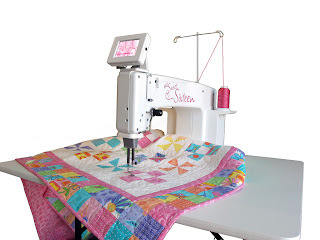 The HQ Sweet Sixteen from Handi-Quilter. I took some time to play with the HQ18 Avante too. It is a wonderful machine but honestly I've become so accustomed to quilting on my home machine that the Sweet Sixteen was truly SWEET for me. A long neck with plenty of room to push around a quilt and lots of speed! I sat at it's lovely table for a long while and quilted leaves on vines and a few swirls with the Sweet Sixteen. The sales person said it looked like I've quilted before (just a little - haha) and then told me of all the wonderful features. I can't recall them all now because I was in a dreamy daze. The speed of the machine was beautiful and the stitches came out so even. It really made my quilting look professional without really trying. The sales person stepped away for a second and came back to tell me I could buy the show machine for a special deal if I wanted to pick it up after the show. Unfortunately the money I have been squirreling away from work isn't even close to what I need yet. For now I will keep dreaming . . . and saving.